HPV R - Grows with the forest. The Gremo HPV R was built during the years between 2001 and 2005. 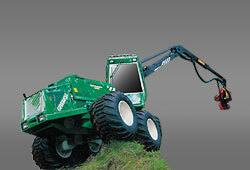 The Gremo 950 HPV R is a manoeuvrable thinning harvester with capacity also for minor final cuttings. Equipped with 8 wheels it features low ground pressure, good stability and excellent availibility also in difficult terrain. Great stress has been laid on the capacity of the coolers to allow for high production even on hot days. The Gremo HPV is a machine you can depend on. Strong, nimble and safe. A machine that can grow with you and help your business to grow. Our customers appreciate that. But our commitment to our customers extends way beyond the sale itself. Our experienced team is always there to help you get the best out of your machine and your time. Clear view of all wheels and all tree tops. With the cab mounted on the bogie, the operator has excellent sight of the close-in work. And because the crane is mounted on the same section, he is also able to keep a much better eye on both the crane and the harv es ter unit in thinning - thus reducing damage to the retained trees. What's more, he enjoys a smoother ride, which soon results in noticeably improved performance all round. As part of its commitment to improved ergonomics, Gremo has incorporated many features into the design of the HPV, some of which are not instantly apparent. 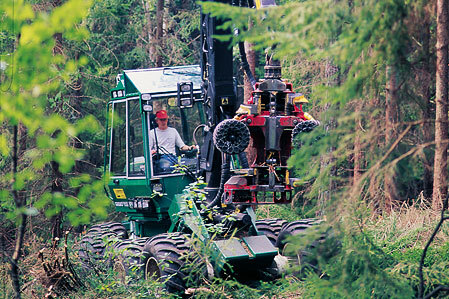 However, the operator will be very aware of them after a few days in the woods. One is the low noise level inside the cab. In fact, it is quieter inside the HPV cab than in a car cruising on the motorway. It is this attention to detail in the design of the machine that enhances the wellbeing of the user, and contributes towards high productivity. Of course, every user has his own preferences and requirements,which is why no two Gremo HPVs look exactly the same. But the fun da mentals don't change. 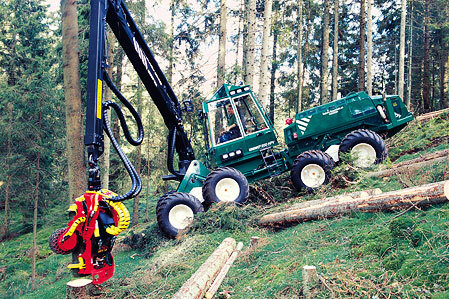 All the machines are built to the same basic design, with the cab and crane mounted on the same chassis frame. 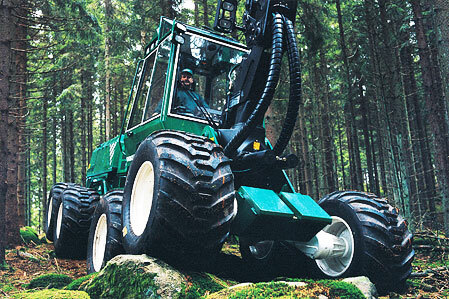 They all have eight wheels and a low centre of grav ity, giving the machine exceptional stability when operating on steep downhill slopes and in tough terrain. The HPV is a flexible machine, which our customers come to appreciate many times over. It is nimble enough for efficient thinning work but also powerful enough for all but the largedimension final fellings.